At 12:45 p.m. on Saturday July 18th I nearly lost my mind, but thankfully I did not loose my cool. I was at a birthday party with my girls at a local beach. It was a beautiful day and everyone was having a great time. Typically, I do not consider myself a helicopter parent. I feel like I allow a reasonable amount of space between me and my children for them to feel safe, confident and independent. However, that amount of space significantly decreases when water is involved. Anyone can drown in less than 2 inches of water if not carefully supervised, or respectful of water safety rules. I reached her in a matter of seconds. I scooped her up into my arms and sat her on my hip and began to sooth her. I was impressed at how little she panicked and she didn’t even cry. Another mom came over to chat and I told her what happened. All of this took approximately 30 seconds of time. The life guard on duty, a young teenage girl, never left her guard tower. She didn’t even come down the ladder to ask me if my daughter was OK, she leaned forward in her chair and casually called over, “Is she OK?” I was so angry I could see red. How could this life guard not identify a dangerous situation that happened literally several feet in front of her guard tower? She gets paid to keep an eye out for signs of struggle in the water. Doesn’t she know that drowning is silent? I was incredibly agitated by the fact she didn’t rush down as soon as she noticed what had happened. It is her job to assess if someone is in danger. Even while I was soothing my child on my hip it was her job to confirm we were safe. That means leaving her chair to come down and speak with me directly. I was so angry I couldn’t even talk to this girl. I was terrified of how I was going to verbally rip her to pieces. Man, that mama bear instinct is STRONG! I’ve had many friends tell me not to worry while at the beach, that’s what the life guard is there for. I have witnessed many parents lying out on the sand (sometimes napping) while their older children are in the water alone. I know I am the first one to say hey, you do whatever it takes to get through your day with kids, but water safety is one of the things where I draw the line on saying Whatever too. Thankfully, I was very vigilant. I know that accidents happen so quickly in water. So, parents, no matter how old your children are, do not take your eyes off of them for a second. Do not leave their young lives up to teenagers who are paying way less attention. I heard from friends at the party afterward that the young guard was texting on her cell phone. Perhaps that is why she completely missed someone struggling in the water only 15 feet from her station. If you are the parent of a teenager, or parent of a young life guard, please share this story with them. Let them know their job is important as people’s lives are in their hands. It may be my child’s precious life in their hands. No text message is worth the loss of anyone’s life. I may not have been a helicopter parent before, but I am now! Especially while at the beach! Click here for safety tips and quick lessons from Lifeguard 101. There are options for water safety inside the home and outside of the home. 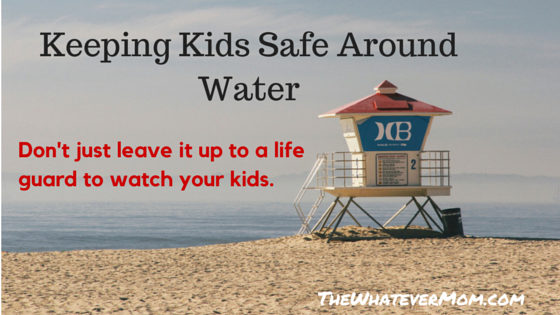 It’s always important for us to watch our own kids especially at the beach, near or in water. For us our beaches can be very dangerous with strong undertows, sleeper waves….So glad that everything turned out fine. Even with good swimmers keeping an eye out for them is super important. Our beaches don’t have lifeguards. Yikes! I lived in Hawaii for 3 years, and I was on edge pretty much the whole time. Every time we went to the beach, I was vigilant about my children’s safety by ALWAYS keeping an eye on both of them. That pretty much meant my husband was the “fun” one playing, surfing, snorkeling with them, while I was the stick in the mud on the shoreline keeping a watchful eye on everyone haha. You can never be too safe when it comes to water! Especially the powerful ocean. I agree! Usually my husband is with me but was called into work. That meant I was alone with the two kids. It is a river beach- normally very calm. There were a lot of boats out churning up the waves. Lesson learned no daddy = no beach. I won’t lie, Water terrifies me! I watch my kids like a hawk when they are in the water! This is such an important post. It can be very stressful to be alone at the beach with kids. That is such a scary situation and I agree that you HAVE to be hyper careful! I’m so sorry the life guard wasn’t more attentive! Water and kids scare me. I have 4 kids and my 7 year old just learned to swim. Really working on getting the littler ones able to swim now. This is so true, we have to be vigilant whenever our children are near the water. It only takes a second and it doesn’t matter how old they are or whether or not they are strong swimmers. Accidents happen in mere seconds. Great post! We are at the beach constantly and with 5 kids my eyes are all over the place. I am not a helicopter parent and my kids do know how to swim but anything can happen so I make sure they are being watched and stay close. Everytime we are at the beach we have random children come over to our areas and no parents in sight….amazing that more children do not end up missing in and out of the water. I love taking my kids to the beach – it is a wonderful way to spend a summer day. Keeping vigilant is important as you have so clearly shared with your readers. Thanks for the reminder for everyone. It only takes a moment for everything to change. Oh gracious! My son knows no fear and this includes water. In fact, he has his first official swim lessons this week and I’m feeling such comfort knowing that we’re both prepared in case of an accident. Summer is such a sweet time, but so important for us to be safe! wow. i can’t imagine… im definitely a helicopter parent. i cannot help it. but even for those who arent, i completely agree, that should change around water. i dont think ill ever let my little girl run into the ocean. she has her first non-mommy and me swim class next week, and im already losing my mind. but its important she learns. Yikes how scary! I’m so glad my daughter is now old enough to be a good swimmer. I still watch her but I feel better. I’m with you. I am not one to hover over my daughter, but when it comes to water I stay close. When I was about 6 years old, we were at the beach and a storm started rolling in. The waves were getting a little too high. I was on one of those inflatable floats (no life vest) and started drifting out too far. I had to jump off the float and try and make my way back to shore. Waves were crashing over my head and I thought I was going to drowned because I couldn’t touch the bottom. The only thing I could do was swim under water until I could reach a point where I could stand. It was really scary and I still do not like to go in water that’s over my head. Oh my gosh that does sound really scary! So sorry that happened to you! I’ve been caught in undertow before so I get anxious around rough water. Oh my goodness, that would have been so scary! My kids love the water, but my 2.5 year old is starting to get to the ‘confident’ stage where she thinks she can do a lot more than what she really can! I have to watch her like a hawk, but it really only takes a second.Such an important reminder – thank you! My kids are also at that stage where they think they can swim, but cannot. That makes me so nervous too!